If you're visiting lovely Carmel-by-the-Sea, California, your trip won't be complete until you enjoy a self-paced historic Carmel walking tour. The landmarks and venues below is a great self-guided Carmel tour itinerary for visitors wanting to learn more about the city's abundant history. First Murphy House is a friendly "welcome center" that has the distinction of being the first structure Michael J. Murphy ever built in the city. It was constructed in 1902 when Murphy was merely 17 years in age. Although Murphy constructed the Harrison Memorial Library in 1926, it was designed by Bernard Maybreck, a prominent architect. Pine Inn was initially the El Carmelo Hotel when it first opened its doors in 1890. 13 years after opening, it changed sites and grew in size. Cottage of Sweets & Golden Bough Playhouse was constructed in 1922 as a loom shop. A year later, Edward Kuster relocated it to Ocean and Monte Verde and turned it into a ticket booth for his latest business, the Golden Bough Playhouse. The theater was destroyed in a fire in 1935. Its replacement, strangely enough, also was destroyed due to fire 14 years later in 1949. The theater was rebuilt for the third time and is still standing now. City Hall previously was the All Saints Church. A Carmel developer gave the church to the Episcopalians in 1912. L'Auberge initially was the Sun Dial Lodge and premier apartment home in the city. A former mayor known as Allen Knight constructed it in 1929. Church of the Wayfayer was designed by Robert Church and has been in existence since 1940. Cypress Inn, previously known as La Ribera, opened in the summer of 1929. Oakland architects designed the structure based on Mediterranean-style buildings. Seven Arts Building & Court was the start of the vibrant Carmel Art Association. Carmel Bakery & Coffee Co.
Carmel Bakery & Coffee Co. has been around since 1904. Conway of Asia used to be the first post office in the United States. China Art Center was constructed in 1930. It was initially the Monterey Savings and Loan Bank. La Bicyclette used to serve as a drugstore for the sanatorium. El Paseo Courtyard features stunning tiles straight from Spain. The Tuck Box is a commercial building that was constructed in 1926. Las Tiendas Building, established in 1929, inspired by old Mexico's architecture, still has its old grillwork, tiles and stairway. Palomas Home Furnishings in 1932 was the city's first dairy. Forest Theater opened in 1910 and was the first outdoor theater to be built west of the Mississippi River. The Hansel & Gretel Houses have a whimsical and quaint atmosphere. Forge in the Forest was constructed for the globally renowned ironsmith Francis Whitaker. The Fire Station was constructed in 1937 using Carmel stone and is still operational. Carmel Drug Store was constructed in 1907. Its sign remains intact today. Carmel Forecast was constructed in 1939 and was called the Bank of Carmel. Alain Pinel Realtors was constructed in 1905 and was the city's earliest city hall. Carmel Art Association Gallery was established in 1927 and is the oldest gallery in the city. It displays pieces by artists from the area. If you want to view all of these amazing historic landmarks in person, the above GPS map will be helpful. Don't forget to check Carmel Calendar of Events for more things to see and do. For dining options within the walking tour landmarks, browse our Eat & Drink section. 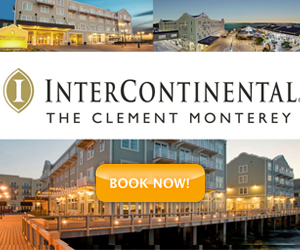 Reserve a hotel room in picturesque Carmel today!